Thank you for an excellent weeks sailing and fun, we all agreed that it was just what the doctor ordered, relax and enjoy the time could not have asked for better. The time you took to explain an exercise was simple and effective and no rush for myself and Chris but especially for the girls which really helped them. The way you reacted was cool and calm when put under pressure during an incident, this made everyone calm and no panic set in. I enjoyed the MOB exercises, marina exercises and now have a better understanding of the wind and working the sails, this was made easier by the way you explained without getting to technical. We will be coming back at some stage and will be requesting you as the skipper if available. Thanks again...happy and safe sailing. We would just like to say a "BIG" thank you for your helpful advice, professionalism and hospitality last week while doing our Skippers course and Competent Crew course. We both had a great time and learnt a lot. Sorry if I appeared like a rabbit caught in headlights on the skippers course but I've always been the same on assesments. I can honestly say though that I have no worries whatsoever about taking a boat out now and were already planning 2 trips away sailing next year. Once again thanks for all your help right through from the booking until the end of the course. We just wanted to give you both a huge belated thank you for the superb training we received earlier this year. 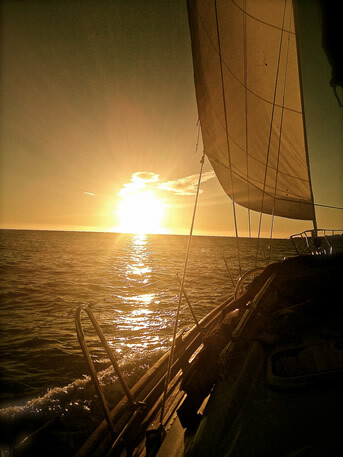 We've just returned from a week sailing in Croatia with a flotilla on what was our first sailing holiday. It was our aim to get to this stage and taking our training with you was the biggest step in getting to this point. 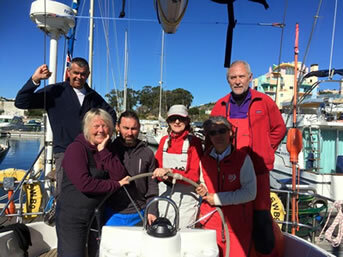 We had a fantastic time and whilst we realise we're still novices with a lot to learn, it was your excellent training that gave us the confidence to take a yacht out on our own for the week. Thanks again and when we find the time to further our training we will definitely be giving you a call. I just had to write to thank you for the fantastic time I've had over the last ten days. I stepped on the Osprey 10 days ago having never been on a yacht in my life. Yes I had spent many hours doing the online theory course and I had a fair grasp of what was to come but within a few hours we were out on the water doing it for real and I quickly realised how little I really knew. Thanks to your expert tuition, not only do I now have a Day Skipper licence but I genuinely feel that I have the competence and confidence to charter a yacht and take my family and friends on many fantastic holidays. Thank you for a great course last week. Thank you for the super teaching and the challenges. Despite blunders and mistakes I came away having achieved my personal goal for the week. I would like to return at some point for more intensive learning and practise. 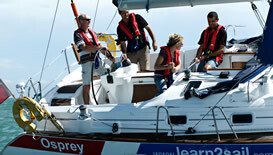 Monika and I are really impressed with the RYA sailing courses, how they meet our needs at a practical level. (The Yachtmaster seeming to be the only available course in Switzerland.) 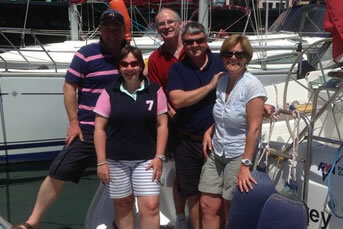 And looking forward to our sailing holiday together next year, feeling much more competent! Thank you for your e-mail! I had a wonderful time with you and the crew on board of “Osprey” and am ready now for our holiday on the lake of Constance in July (little water… little boat… but it has got sails!). I will definitively consider a refresher and/or Day Skipper Course for the next year – so you will certainly hear from me again. Have a good time in Albufeira and surrounding waters! One of our plans for retirement is sailing. In order to prepare that dream we wanted to start the learning process. After a short search on the internet (with youtube videos) we were convinced that Learn2Sail would probably the best choice for us. 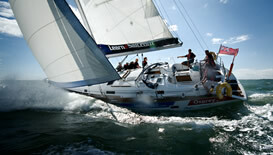 Our choice for the “Beginner 2 Skipper” course would give us a pretty good idea what life on a sailing boat would be. So our adventure started on March 15 2015. We were informed by Jane and Mark during the welcome that these would be the fastest 2 weeks of our lives and guess what? They were indeed even faster than fast :-) The welcome, the organisation of all logistics, the practical courses, the theoretical course, the “colleagues”, the Algarve, (I can continue…) made it such a wonderful experience. 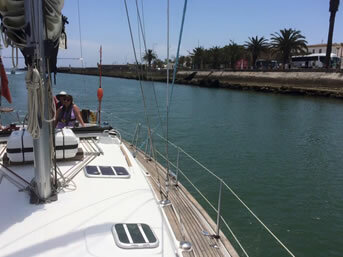 In fact it was such a nice experience that we already booked the next course with Learn2Sail and that won’t be the last one!! Jane and Mark, thank you so much for helping us making a dream come true! Many thanks for a brilliant week with a lovely group of people. I would highly recommend Learn2sail to anyone who wishes to experience the delights of sailing and to gain useful qualifications. Thank you to Mark who understands people's strengths and weaknesses and manages to explain everything very clearly and patiently, often with humour and amusing ways to remember key points.His renowned "eyebrow technique" always gives an indication of how you are doing! Thank you to Jane who organises things so efficiently behind the scenes so that it all runs smoothly.You and Mark make a great team. Last but not least, thank you to Robbie "cabin boy extraordinaire", who makes a mean pasta and always seems to be there at the right time and offer subtle advice without making you feel foolish. Mark will certainly miss you when you move on. I wish you good luck in the future.I'm sure you will do well. I really enjoyed the last evening when we went for a meal together. I couldn't stop talking (sorry about that) and laughing! I had a great week with great people. I've finally found time to look back at the pictures that were posted last week, and just wanted to say thank you to you both, and Robbie, for such a super week. The highlight for me was my first taste of skippering with the trip out to Lagos and Alvor, followed by the evening trip up river. It was the first time all that 22 weeks of dry shorebased theory stuff became useful, and will not be forgotten. Accommodation and food were great, and airport transfers went like clockwork. Looking forward now to getting in some hours in my logbook and really putting into practice what you've taught. A beam in my kitchen now has a shackle fixed for upside down Lightning Bowline practice! If you would keep me on your mailing list and prompt me in a year or two about a Coastal Skipper course that'd be great. Maybe see you at a boatshow sometime. Thanks again! Hi Mark, Jane & Robbie. It has been a week now since being on the water with you guys and I so want to be out there again. I would like to thank you Mark for your outstanding teaching and understanding, especially having the patience with a daft old bugger like me. It has made me realise how much respect we need to give to something that from the outside looks a bit of fun and easy to do. Oh so wrong. I will be honest to say that those two weeks, especially the Skippers part were very intense, but the satisfaction as you shook my hand when we returned after our last sail was a very humbling proud moment. You nearly made a grown man cry. Thank you. Jane, thank you for your warm hospitality, It was lovely talking with you. And I loved the soups. Young Robbie, thank you for your help on board, your knowledge is second to none, and you make a cracking cupper. With Sarah's blessing I am looking for something at the moment. Around 25-30 foot on the south coast. It`s a start. Again I would like to thank you all for my two weeks on board and I will be perusing with my theory with the intention to contacting you later in the year to move forward to the next level. Thank you for an excellent course, your teaching skills are second to none and for your patience well I think I tested it, but you didn’t break…. It was a great two weeks can’t say any more. Will be booking a day skipper master class soon. Back in the Uk. We spent 2 fabulous weeks with our crew and Mark!! I'm sure we'll see you soon! Take care you all. I’ve been trying to find the time to email you!! Thank you very much for the excellent hospitality extended to me during my stay and an even bigger thank-you to Mark for the patience shown while teaching me. I would certainly love to come back and sail with you again and in fact picked up the Yachtmaster theory book whilst at the RYA this morning. It was not until I returned to home that I realised that the RYA headquarters is less than a mile away from where I’m living!! So if you need anything picking up don’t hesitate to ask. Just a quick one to say thanks to you Robbie and Jane for everything on the course. It was a really great course and everything was presented very clearly. The only things I found difficult to grasp were mainly down to my own poor maths. Hope the turk's head on the boat is ok, i just about remembered how to tie one so hopefully it holds and if it starts to slip superglue works well! Hope all is well and thanks again. See you t the boat show in January. 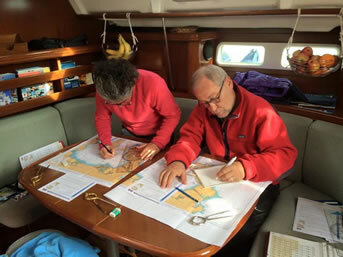 Very many thanks for all of your help last week during our Competent Crew and Day Skipper courses. We all had a very enjoyable time and learnt a lot. Mark - a big thank you for your patience and ability to explain things so clearly; Jane thank you for the seamless organisation. Can you also pass on our thanks to Robbie. We will certainly be in contact again in 2015 to try and extend our sailing knowledge with Learn2sail. I just wanted to let you know how much I enjoyed my course in early November. It was fantastic and helped me achieve and overcome obstacles that I somehow thought would be a little more difficult. Mark – you are a great instructor, clear, precise, patient and all with a sense of humour, which was brilliant. I felt safe when we were out even in the stormy conditions and I absolutely loved it. Osprey is a lovely yacht and I felt very comfortable and safe overnight. So when I take my skipper, and yes I am thinking about it! I will definitely be in touch. Jane – thank you so much for your planning and answering my constant questions, again like Mark you have patience, so thank you for that. I will be in touch at some point when I can come out again once I have worked out my holidays etc. Oh and thank you for pairing me up with likeminded people, it definitely helped eased my way into loving sailing. Take care both and thanks again for an exhilarating trip, I loved it! I really enjoyed the training. Mark was an excellent trainer enabling me to learn the ropes whilst making it really enjoyable at the same time. 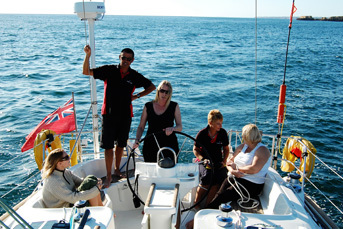 Just a quick note to thank you for making our day skipper course such an enjoyable experience last week. Duncan and I thoroughly enjoyed our time with you and we certainly learnt loads in the few days we were on the boat. I am sure Jules and Dave are star pupils and give them our regards when you see them tomorrow. Thank you again and hopefully we will be down to see you in the not too distant future. No sailing for us this weekend – gale conditions down on the South Coast! With best wishes, Angela and Duncan"
For me, your style of tuition was great - you made it good fun and was always encouraging, but it was clear what was expected and standards to adhere to!! It goes without saying that I'd love the opportunity to come down to Portugal again, but always limiting for me is my holiday time, so I'll just have to see how things pan out. I have joined Salcombe Yacht Club and hope to be getting involved in some weekend cruising/racing. I've no doubt the Day Skipper qualification will speak louder than words! I hope you have a great summer and many, many thanks again for a brilliant experience. Had a very good 9 days with you, really instructive and pretty hard but also great fun." 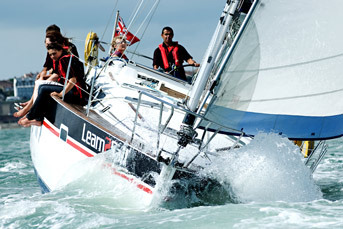 "I can not recommend Learn2sail highly enough. You get the benefits from such a personal experience provided by Mark and Jane. Mark is an exceptional teacher, with endless patience coupled with the tenacity required to keep repeating and demonstrating things until you get it right, there is never a raised voice, all it takes is a raised eye brow and you know you could have done it better! Jane works tirelessly on-shore making everything tick like clock work from your booking arrangements to even the occasional home made soup for lunch on board! The Algarve is a beautiful place to sail with interesting coast lines, great marinas, fantastic restaurants and of course the weather, even in December we came back with a tan! All in all I had a fantastic 14 days completing the practical and theory day Skipper and thoroughly recommend Learn2sail and the beautiful Algarve." Thanks for a fantastic week, we both had the most amazing time on the boat. We learnt so much from Mark who is a very patient instructor in a very friendly and comfortable environment. As an aside I was also really impressed with the state of all your gear and the boat facilities, everything felt new and very clean. Sure to see you again soon! Just a quick note to say, we had a fab time and everybody enjoyed themselves - so thanks! Tim is a lovely chap and a great teacher and we will be back. Having just completed the course,I would like to say thank you for providing me with a comprehensive knowledge and experience from the past 9 days. “Hi Mark and Simon and team. I had a great five days on the Algarve with you. The patience, expertise and experience of you all was of incomparable value to me. “We'd like to thank you very much for a great course. 'Osprey' was comfortable and well equipped and Simon was a welcoming and a superb instructor. We both feel much more confident and competent now and are looking forward to completing the Day Skipper Practical in June. 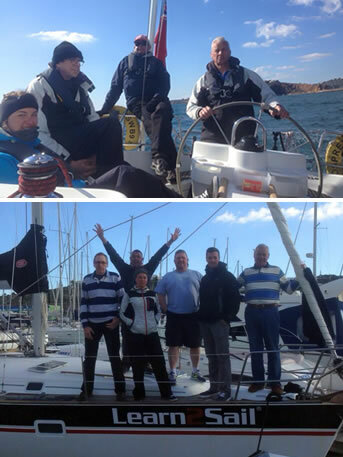 I have just returned from doing the Complete Day Skipper Course for 9 days with "Learn2Sail" at Albufeira. 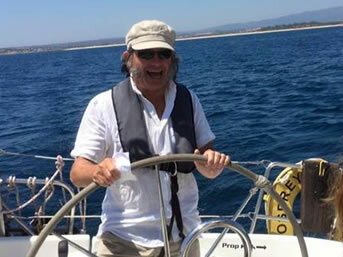 I had an absolutely delightful course and would recommend "Learn2sail" without reservation to anyone who is thinking of doing more sailing, at any level! Mark and Jane, who run Learn2Sail, provide an excellent service to teach a range of qualifications and experiences to those wishing to improve their skills. The tuition/instruction by Mark is very good indeed, allowing course members to develop their knowledge and confidence of boats! 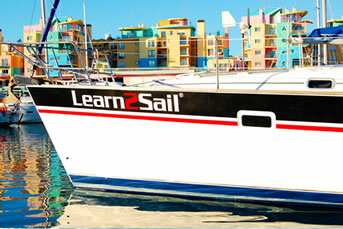 I would highly recommend "Learn2Sail" to anyone who is considering taking one of their courses -you won't regret it! Thanks to Mark & Jane.